Can you even imagine what the first toothbrush probably looked like? Your Sachse dentist is here to take a walk back through time to explore the evolution of the toothbrush. With help from The Library of Congress, Dr. Ernani Domingo and our team have compiled a timeline with things that’ll intrigue you about the first few toothbrushes of our time. 3000 BC – The earliest form of the toothbrush was found back in biblical times. It was called, the “chew stick” and used by Ancient civilizations. People would rub this thin twig with a frayed end against their teeth to remove food and plaque. This would be the time to thank your dentist for never exposing your gums to splinters! 1498 – The first bristle toothbrush was invented in China. Believe it or not, this form of the toothbrush had many similarities to the toothbrushes used today. These devices were made by attaching the stiff, coarse hairs from the back of a hog’s neck to handles that were typically made from bone or bamboo. 1938 – Thankfully dentistry rid the boar bristle. Dupont de Nemours introduced nylon bristles, and Americans welcomed Doctor West’s Miracle Toothbrush, the first nylon toothbrush. 1960 – The Squibb Company introduced Broxodent, one of the first electric toothbrushes made, to the American market. Thankfully there have been many advancements to the world dentistry, allowing toothbrushes to help specific patients with specific dental issues. 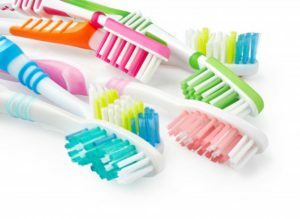 The variety of options may seem overwhelming when you’re walking down the dental aisle, but just remember this: you need a toothbrush that makes you feel comfortable and ready to use. The American Dental Association recommends that you choose a toothbrush that fits comfortably and allows you to effectively reach all areas of your mouth. Whether you decide to use a manual or a powered toothbrush, make sure that you thoroughly clean all surfaces of your teeth twice a day. You should replace your toothbrush when it begins to show wear or every three months, whichever happens first. It is also very important to trade out your toothbrush after you’ve had a cold since the bristles can collect germs that can make you sick all over again. Next time you reach for your toothbrush, you can think back to this timeline and truly appreciate the advancements in dentistry. Dr. Travis Rottman has worked in the dental field since 2011, watching and keeping up with the changes of dentistry. He is passionate about working with patients to help them reach their dental goals. If you have questions about your oral hygiene routine or using the best tools, feel free to call our Sachse office.